I love my chassis stand. It’s the winter here in Seattle and it gets cold outside occasionally. Cold enough that I can’t vent my soldering fumes out an open window like I normally do most of the year, but I don’t want them in my apartment. Fortunately for me, my chassis stand is the same width as my stovetop and sits neatly under my externally-venting range hood so I can move it over there for ventilation. The stand can hold the chassis up at any angle and supports a lot of weight. Every time I use it, I’m impressed with the build quality and flexibility. It’s not as nice working in the kitchen as it is on my normal workbench, but it gets the job done. 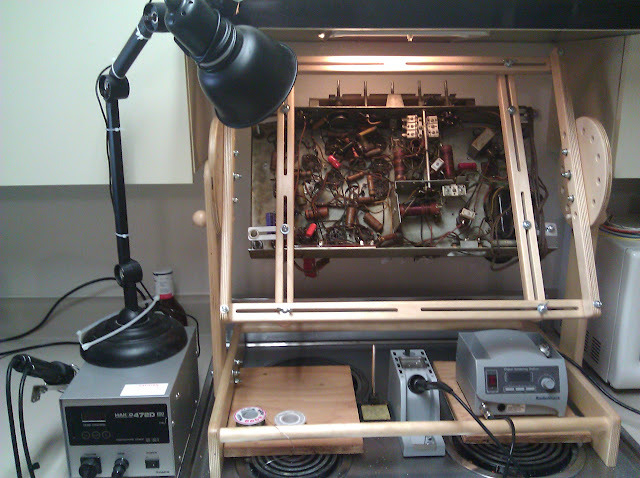 This entry was posted in Commentary, Photos, Projects and tagged antique radio, chassis stand, soldering, stovetop, vent. Bookmark the permalink. 2 Responses to I love my chassis stand. Robert, the chassis stand was designed and cut by a gentleman named Steve Strong, he’s a member of the Oklahoma City antique radio club I believe. He accepts orders via e-mail at (remove the spaces, and change the # to an @…I don’t want him to get a ton of spam) “s c s t r o n g 1 # c o x . n e t” and takes about 3 weeks to complete an order as it’s built by hand. Is that something you made or purchased? Are there drawings available? Is it for sale or if you made it would you consider making another one? It is exactly what I need. I have Parkinson’s and have developed a lot of jigs and aids to help me. The doctor wants me to continue with my radio repair/resotration as it’s good for my mind and my fine motor skills. This would help greatly. I have been playing with ideas for a chassis holding jig then I saw yours and Eurika it is what the doctor ordered.